It doesn't seem possible that our site is now twenty years old, but it is! We're planning some new stuff to keep the ball rolling, including new About Us and What's New pages (duh! ), a new Facebook discussion group to complement our Facebook page, a searchable and organized archive of our original disussion area (about 14 years of folks sharing their memories! 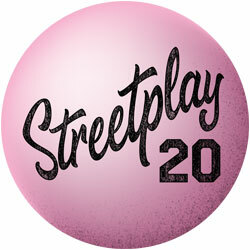 ), a tribute to our dear friend in play, Bernie DeKoven, and of course, Streetplay Twentieth Anniversary Gear (t-shirts, caps, and more). Stay tuned to this space, as well as the Streetplay Facebook page, as we roll out these and more anniversary features. We've assembled the Streetplay Galleries to present the work of professional artists who have documented the experience of play all over the world. Over the years, we've assembled some stunning exhibitions. 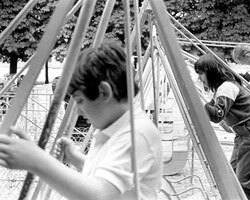 In this gallery, Karen Bell points her camera at the place grown-ups invented for kids to play: the playground. It might make you seek some monkey bars to climb. In the summer of 2008, Major League Baseball decided to hold its annual All-Star game in Yankee Stadium one last time. Willie Mays was invited to his old stickball stomping grounds to celebrate; take a look at our coverage. The stories from our readers about their first kiss will make you laugh... and blush. A collection of general photography featuring walls and the games we play with them. The Playful World project documents the games and play of children from different places around the globe, in this case, Philadelphia. Please share the joyful aspects of our shared cultures. A lot of our readers have shared their stories with us first-hand in our Member Spotlight section. Here, Willie Blas tells us about his West Coast style self-made stickball bats. The Koncrete Kids... flying kites! See this installment of this Streetplay-exclusive comic strip, fresh from the high-flying mind of Donald Jefferes. This time, the kids have a fool-proof way to win a kite-flying contest--with just one kink to work out. Steve Mercado, a leader in the stickball community, was one of the brave firefighters lost in the World Trade Center on September 11, 2001. This is our tribute to him. The Smithsonian Institution invited us to DC to introduce America to our favorite games. Read how it went! 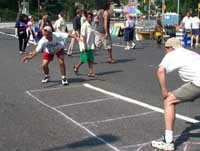 Throw some popcorn in the microwave, grab a jumbo-sized soda and watch street games in motion right on your computer! Maybe we're not Google, but we take a shot at listing some of our favorite play-related websites here. Boxball is one of the many games we cover in The Games section. Skully in academia? 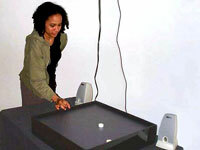 Read our coverage of its interpretion at NYU's Interactive Telecom Program.